Winter gloves are a truly critical part of your winter wardrobe. Having cold hands is not much fun so buying the right kind of gloves to suit your lifestyle is very important. In fact, you'll need several pairs to suit different winter conditions and activities that you'll be doing. For the most part, they need to be the warmest gloves you can afford but equally important, they also need to be waterproof too. Cold season gloves come in all range of styles, types and materials. It all comes down to the purpose of why you are buying them. It may also depend on whom the gloves are for too. For yourself, a nice pair of leather winter gloves makes sense but for your child, buying inexpensive woolly mittens is more useful and age-appropriate. Are these gloves for winter work, every day use or for more formal occasions? Then there are specialized gloves for the many outdoor sports as well like winter motorcycle riding, horse riding, winter cycling, winter skiing just to name a few. You can also get heated winter gloves too. The style and type can be anything you want and comes back to what do you want the gloves for. It can be a hard-working outdoor glove or a looking-good glove for work as well as everything in between. Leather winter gloves are great for that daily trip to the office but very poor for shoveling out the driveway. Speaking from experience, it's also an easy way to destroy good leather gloves too; using them for the wrong purpose. This list goes on. And in a huge variety of colours too. When you start looking, you'll be quite amazed at the variety available. Finding gloves seems to be one of those items that are readily available from very early (fall) to very late in the season (spring). Watch for pre and post-winter sales when the prices are usually very good. 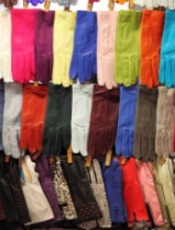 Waterproof and windproof material is the most critical factor in buying gloves. What would be the point otherwise? It's winter! Guarding against cold, snow and icy winds is your number one concern. These man-made materials are sturdy and last-lasting too. The insulation is generally quite thick and offers good protection and warmth for your hands. Stylish leather gloves are popular but the leather is thin as is the wool lining too. For short trips, this type of leather gloves do the job quite well. They are great for work or more formal occasions where you won't be spending much time outside. Keeping your hands warm in leather gloves like this type won't provide much warmth for the most part but they do look and feel good! You can get more robust and thicker leather gloves with thicker insulation inside too. This more rugged type of leather gloves is great for spending more time outdoors and stand up to outdoor wear and tear much better. The most common and popular type of lining is a cotton/poly/blended lining. The glove lining needs to be well insulated to be warm but they also need to be able to wick away moisture too. Sometimes this is not the case, as the inside of the glove does get very wet from persperation. Don't be too concerned about them getting wet, just hang them up to dry for a few days. If you are doing outdoor work, the thickness of the lining is less important as you'll be working hard so your hands are likely to be warm anyway but will increase the chance of your gloves becoming wet inside. For any kind of outdoor sports, generally you want more insulation which range from thin to thick. However, this will depend on the type of sports you are doing as there are specific gloves for specific sports. The best rule of thumb is buy the best gloves you can afford with good insulation and a durable exterior which might be all leather, all man-made materials or a combination of the two. With well-insulated gloves, they will protect your hands better as well should you slip and fall. Cheaper gloves may be attractive because of the price but will offer very little protection against the winter cold and will last only a short time, maybe just one or two seasons - if that. It's important to buy gloves that extend well beyond your wrist to keep out the cold air. That gap between where your glove ends and your coat begins is important to cover properly. Getting snow up your sleeve or feeling the cold air is not much fun! Everyone needs lighter weight gloves for the fall to keep the chill out as the days grow colder or as the days grow a little warmer in the spring. Wearing a thinner type of glove in the fall and spring work well. Lightweight wool, soft knit or material gloves that can easily be folded and stuffed into jacket pockets are fine too. They won't be waterproof but will keep the chill off. There are chemical hand warmers You can add to increase the warmth of your gloves. These are usually one-time-use only and look like small tea bag-like pouches that chemically interacts with the air inside your glove or mittens to heat your hands. Since mittens have just one main space for your hands, these are ideal. Gloves? Not so much. They are usually sold in pairs and they can last for a few hours or up to a day depending on the type you buy. Sport retail stores have them during the winter season. You can also use them inside your winter boots and clothes too. Going all out, you can also buy electrically heated gloves too. Mittens are great for children as air is trapped inside the one main hand area so it keeps little hands warm and protected. I've worn mittens for everyday use but they are not really practical as you have to take them off to handle anything thereby exposing your hands to the cold. However, for skiers, snowmobilers and other outdoor enthusiasts, wearing mittens is a good choice for the same reason; it keeps your hands very warm indeed. For everything else, wearing gloves is just way more practical for every day winter living. You want to get your money's worth out of what you buy so taking care of your winter clothing and accessories makes sense. Depending on the what type of material the glove is made of, there are some things you need to know first before you attempt to clean or spruce them up.